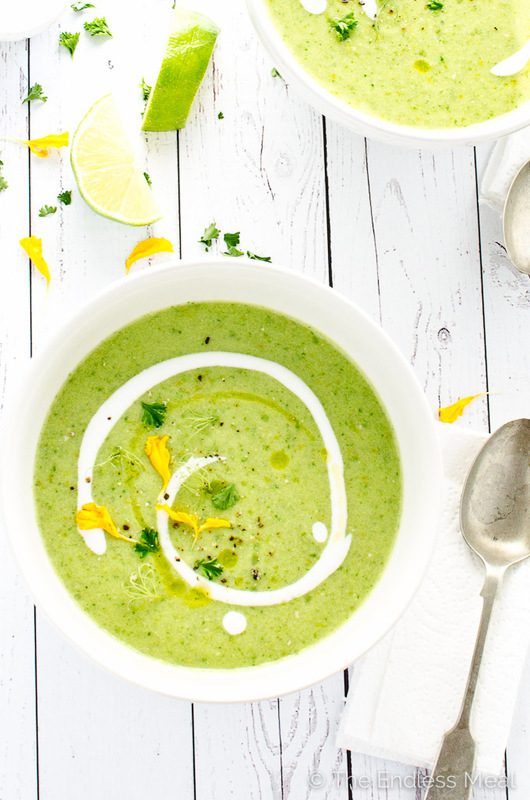 Did you know that it's possible to eat a bazillion bowls of green gazpacho without getting tired of it? And by a bazillion bowls I mean eight bowls, which still seems like a hell of a lot of green gazpacho for one person to eat and still be craving more. I think there might be something wrong with me. No, wait, it's not me, it's the soup. You guys, there's seriously no better meal to eat on a hot summer's day than this. It's light, refreshing, and you don't need to cook it. No cooking on a hot day = awesome! (How am I actually a food blogger?) There's no oven to heat up your already too hot house, no blazing hot BBQ to stand in front of and no heavy meal to sit through when all you want is a plate of cold fruit. See … gazpacho is perfect. I *might* have even had a bowl for breakfast. Please don't judge. 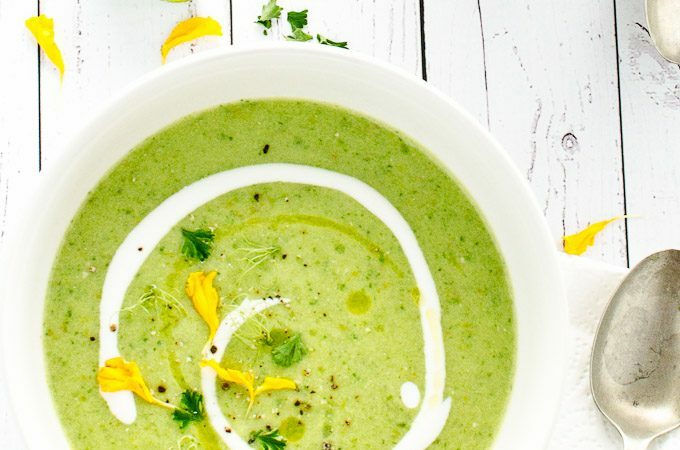 Green gazpacho is made using ripe green tomatoes. I love green zebras, but any green variety will work great. Of course, you could always use ripe red tomatoes, but then the whole green part of the green gazpacho wouldn't make much sense. Whatever kind of tomatoes you decide to use be sure that they are super ripe. You want them to be soft, squishy and smell strongly like a tomato. I always buy the cheap bags of tomatoes that no one else wants. You know, the ones that are so soft you can barely cut them and are on the verge of going bad. Don't pick the pretty tomatoes, the ugly ones always taste the best. 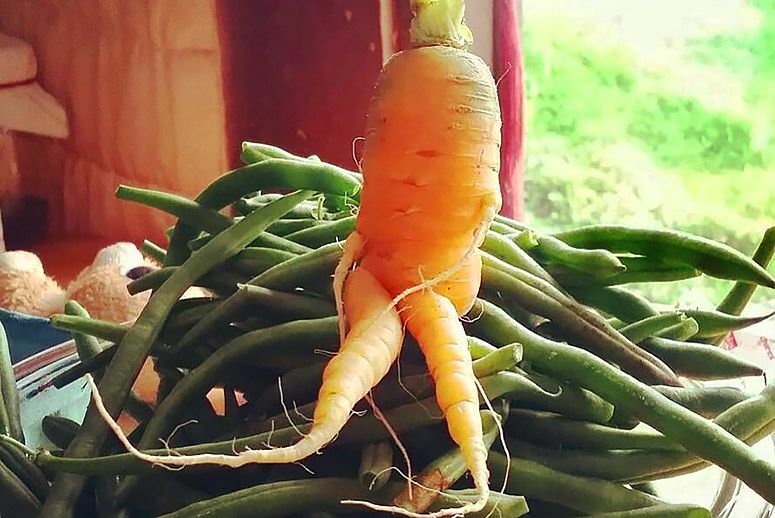 Speaking of ugly tomatoes, have you heard of the whole Ugly Fruit and Veg thing going on? It's crazy awesome. We (meaning me, you and all of our grocery stores) throw away a ridiculous amount of food, all because it's deemed ugly. Like 1/3 of all the fruits and vegetables grown are simply tossed in the garbage. And sad too, cause the ugly fruits and veggies are totally the cutest??? After I posted an article to The Endless Meal's Facebook page congratulating France for banning supermarket food waste a reader (hi Wendy!) sent me a message suggesting I watch the documentary Just Eat It. If you haven't seen it, I highly recommend it! 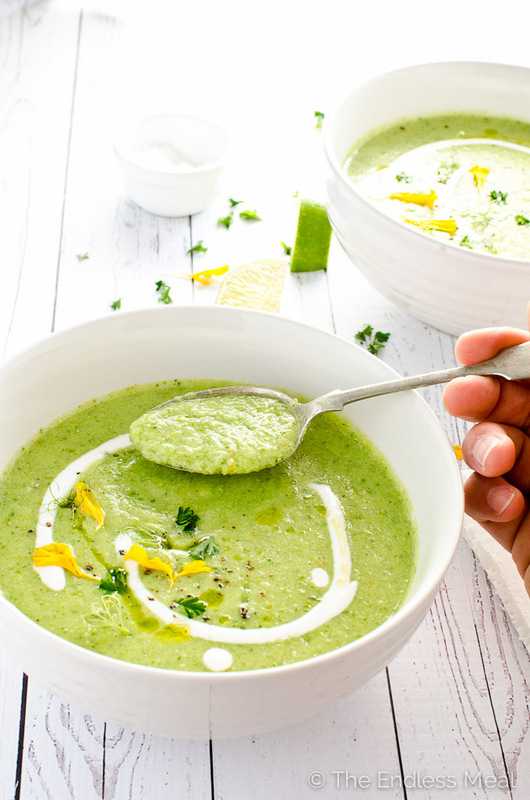 If you make this Green Gazpacho recipe, make sure to snap a pic and tag @theendlessmeal on Instagram so I can like and comment on your photos. I love seeing TEM recipes you guys recreate! This easy to make green gazpacho is made from super ripe (aka: ugly) green tomatoes and is so light and refreshing. It's also naturally vegan + paleo! In a large bowl mix the tomatoes, cucumber, pepper, onion, parsley and garlic. Add the 1 1/2 teaspoons of sea salt and, using your hands, mix everything together well. Set the bowl aside on your counter for 1/2 hour, or up to 4 hours. Add the vegetable broth, olive oil, white balsamic and lime juice to the bowl with the veggies. Working in batches puree the soup until it is quite smooth. Taste and add more salt as needed. Either serve immediately with some or all of the garnishes, or transfer the soup to large jars and chill it in your fridge for up to 3 days. This is so NOT ugly I can’t stand it. hehe. Perfect for a hot summer day. 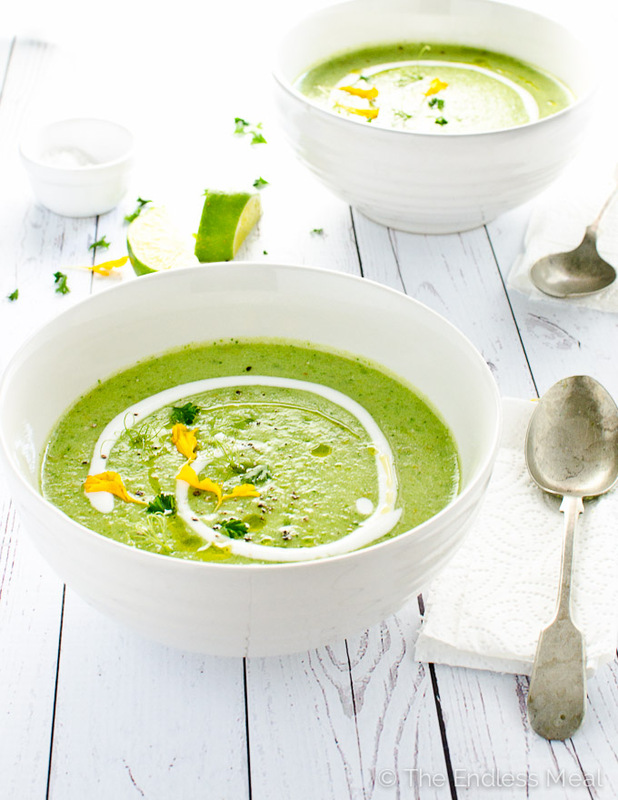 Green gazpacho for Green Evi … it’s perfect! O I need to make a summer soup since I made ZERO soup this past winter! None!